A number of studies present cross sections of the Cape Fear interval that include geophysical logs (gamma ray, spontaneous potential) (Colquhoun and others, 1983; Aucott and others, 1987; Temples and Waddell, 1996). These cross sections indicate that sands are generally discontinuous (R. Willoughby, South Carolina Geological Survey, personal communication, 2000). 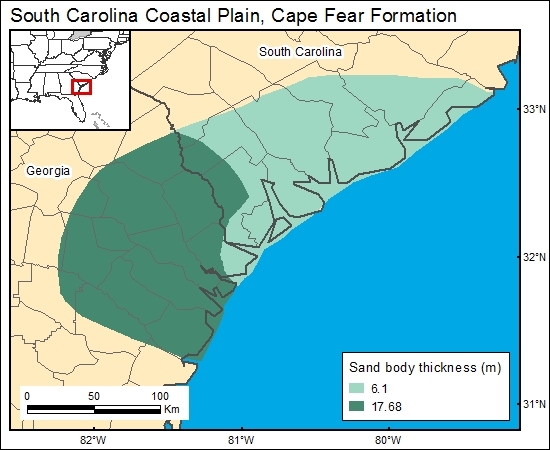 Brown and others, (1979; their table 7) determined that the thickest potential reservoir sand in the Cape Fear interval ranges from 40 to 58, with an average of 49. These thicker sands tend to be more continuous. For the GIS, we chose to use the thickness of reservoir sand as determined by Brown and others (1979). Aucott, W. R., Davis, M. E., and Speiran, G. K., 1987, Geohydrologic framework of the Coastal Plain aquifers of South Carolina: U.S. Geological Survey, Water-Resources Investigations Report 85-4271, 7 sheets. Brown, P. M., Brown, D. L., Reid, M. S., and Lloyd, O. B., Jr., 1979, Evaluation of the geologic and hydrologic factors related to the water-storage potential of Mesozoic aquifers in the southern part of the Atlantic coastal plain, South Carolina and Georgia: U.S. Geological Survey, Professional Paper 1088, 37 p., 11 plates. Colquhoun, D. J., Woollen, L. D., Van Nienwenhuise, D. S., Padgett, G. G., Oldham, R. W., Boylan, D. C., Bishop, J. W., and Howell, P. D., 1983, Surface and subsurface stratigraphy, structure and aquifers of the South Carolina Coastal Plain: Columbia, SC, State of South Carolina, Office of the Governor, 78 p.
Temples, T. J., and Waddell, M. G., 1996, Application of petroleum geophysical well logging and sampling techniques for evaluating aquifer characteristics: Ground Water, v. 34, p. 523–531.